A luxury collection of nine self catering lodges tucked into the hillside with sweeping coastal views across Bude on Cornwall’s North Coast. Gwelva Hills is the perfect destination for a romantic break for two, family holidays and get-togethers with friends. Adjacent to the holiday park but with it’s own entrance is where you will find our newly built two and three bedroom luxury self catering lodges. 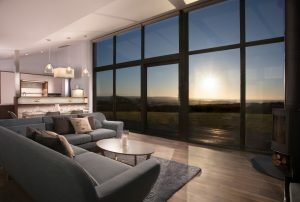 Step inside and you will be drawn to the large open plan living area flooded with natural light from the floor to ceiling windows that frame the sea view. The interiors in each property are all stylishly designed using soft hues which draw inspiration from the surrounding coastal landscape, creating the perfect space to relax and soak up the scenery. The spacious open-plan sitting, dining and kitchen area mean you will never miss out on a moment with friends and family. The log burner and modern, contemporary sofas make for a cosy place to spend winter days snuggled with loved ones. During the summer months, it’s all about the outside decking with woven cubed furniture, BBQs and glasses of ice-cold g & t’s – all you need to decide is who’s on drinks duty! 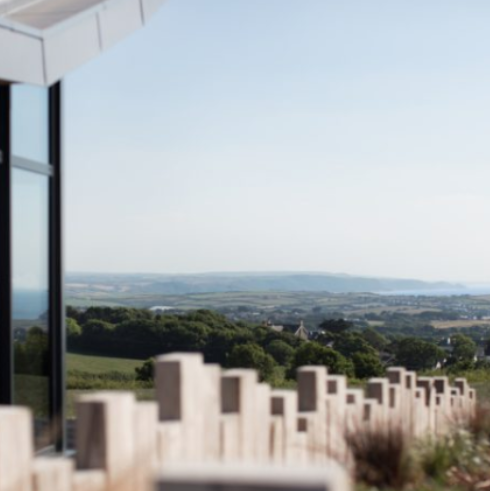 The eco-friendly rooftops sprinkled with wild-flowers, the bleached oak cladding and the beautiful reflective glass windows allow the landscape to echo throughout and blend the properties perfectly into their countryside setting. Each property has one large master bedroom with king-sized bed and en-suite with bath and shower facilities. The second and third twin bedrooms have en-suites with luxury showers. There is an option to have one twin bedroom as a super king in each lodge. All bedrooms have under-floor heating and heated towel rails. Dogs are charged at £10 per night. Guests are only permitted to bring one large dog or two small dogs per lodge. Gwelva Hills is available for guests to check in and enjoy the wilds of Cornwall throughout the seasons. Christmas and New Year are particularly special times to visit because each property is tastefully decorated with twinkly lights and Christmas trees meaning all you have to do is bring the turkey and the presents. Those who are brave enough can take part in the annual Bude charity sea swim, wetsuits are not allowed – brrrr. Celebrate the new year in style, gather friends and family for a special dinner and as the clock strikes midnight watch the sky come alive with colour as the celebratory fireworks over Bude begin*. Prices start from £637. Sandy beach days and muddy walks mean beach towels, wetsuits, wellie boots and coats so at the entrance to each property is a spacious utility room complete with washing machine and tumble dryer, as well as a coat and boot rack, the perfect storage space for outdoor gear. At the side of each lodge is parking for two cars and additional parking is available on site free of charge. The kitchens have integrated fridge/freezers, induction hobs, double oven, dishwasher, microwave and come fully equipped with utensils and crockery. There is Wi-Fi to each property, a large Smart TV and DVD player in the living room, and smart TV’s in each bedroom so you won’t miss out on your favourite shows. Wooda Farm Holiday Park is open from Easter – October and as a customer of Gwelva Hills, you can benefit from all the facilities the site offers. Including The Courtyard, The Loft, The Lodge Takeaway, fishing lake, tractor rides, The Farm Shop, games room, soft play area, yoga and archery. Open all year are the tennis court, pitch n putt course, woodland walk, Hannah Rose Beauty, Sue Read Art and the fitness suite. Gwelva Hills makes the idyllic base to explore everything Cornwall has to offer, all you need to choose is choose your property and book your stay! Please note, front facing properties have uninterrupted coastal views and the second row properties have sea views but the roofs of the front row properties do obstruct the view slightly – it’s still an amazing view! *Please note that the firework displays aren’t organised – the perfect view will allow you to see the displays in the surrounding area!